BATON ROUGE — Over the past week, three key Democratic officials have announced they are switching to Republican. Two of them are black conservatives. 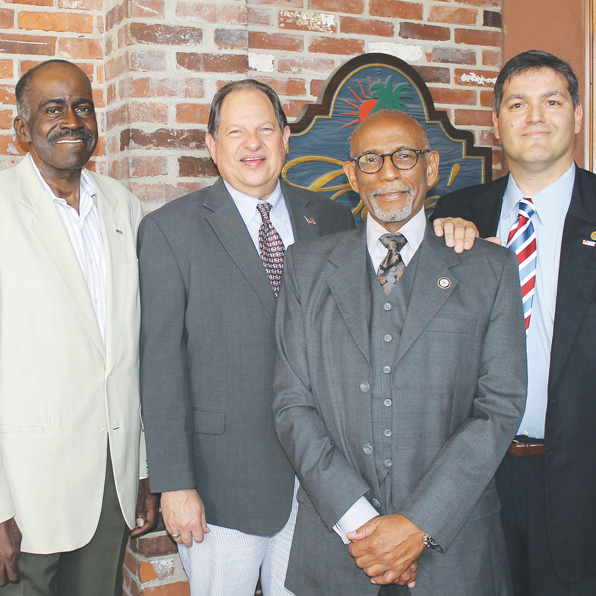 State Sen. Elbert Guillory of Opelousas announced his change of party registration at a national conference of black conservative leaders held in Baton Rouge last week. Guillory became the first black Republican in the Louisiana Legislature since Reconstruction. One of those attending the At-Large Conference was City of Central Mayor Pro-Tem Ralph Washington, who like Guillory was a conservative black Democrat. Washington said that listening to the speakers at the conference and seeing the courage they had to speak the truth was what inspired him to join the Republican Party. “I can no longer affiliate myself with the Democratic Party and the things they stand for,” he said. Washington was a main speaker at Tuesday’s Ronald Reagan Newsmaker Luncheon at Café Américain on Jefferson Highway. He told his life story — how he was born at New Orleans Charity Hospital, one of 12 children raised in poverty, how he attended segregated schools, and was on the first bus of black children who integrated East Ascension High School. His father and other black parents rode behind the school bus with shotguns in their pickup trucks. When the bus pulled in front of the school, the parents weren’t allowed to enter the school property. An angry crowd of white students was pounding on the bus and shouting racial slurs. When Washington exited the bus, he was pushed and shoved. Frightened, he got back on the bus. “But I realized then,” he said, “that you have to get off the bus, and I did!” Washington made it into East Ascension High School, became successful, and was chosen to represent the school at Boys State. He went on to Southern University and earned his degree. “You have to be willing to get off the bus!” he told the Republicans at the Reagan luncheon. When he was a child, some of the other black boys pointed at the industrial plant near their home and said they wanted to work in that plant when they grew up. But Washington told them, “I want to run that plant!” And eventually he did. Then after a company buyout, Washington decided to start a business, Red Stick Cleaners, in Central. When Central incorporated, he was appointed to the Central City Council. When elections were held, he led the field of 12 candidates with more than 65 percent of the vote. Not bad, considering more than 90 percent of the voters were white. The City Council named Washington the mayor pro-tem, a post he still holds. “I’m not a Democrat,” he told the Republicans, “and you can be sure I believe in the right to keep and bear arms and our other constitutional liberties.” To a cheering, standing ovation, Washington was welcomed to the Republican Party by state GOP chairman Roger Villere. Washington is now the highest ranking black Republican city official in Louisiana. Also on hand to announce his change of registration was prominent Baton Rouge attorney Randy Piedrahita, a partner in the firm of Dué, Price, Guidry, Piedrahita & Andrews. Piedrahita formerly served as General Counsel of the Louisiana Democratic Party. But Piedrahita said he had always felt he was a conservative and in recent years the Democratic Party had moved so far away from his beliefs that he could not stay there any longer. He too said the right to keep and bears arms is one of his most important issues.